It took me a while to get the overview of Zentangle. I visited many blogs with fantastic Zentangles. Thereby I became aware of some competitions. By Joey I found a weekly challenge of Monotangle. This week # 78 - OKE by Michele B.
I hope that I can join as a beginner. I enjoyed very much to tangle this pattern. Es erforderte einige Zeit, um einigermassen die Übersicht über Zentangle zu bekommen. 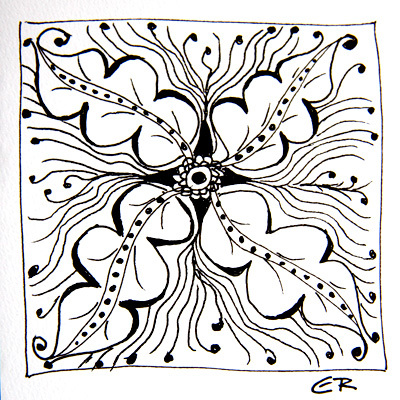 Ich besuchte viele Blogs mit fantastischen Zentangle. Dabei wurde ich auch auf Wettbewerbe aufmerksam. Bei Joey fand ich eine wöchentliche Monotangle challenge. Diese Woche # 78 - OKE von Michele B. Ich hoffe, dass ich als Anfänger hier mitmachen darf. Es hat mir viel Freude gemacht, dieses Muster zu tangeln. Welcome to challenge country. Your version of Oke is lovely, I really like the feathery look surrounding the leaves. I hope you have fun getting to know everyone and entering each week. There is a great virtual community here. Thank you my dear for your nice words. I'll try to follow the weekly challenges, but it is so much for me to learn. Thank you Michele, meanwhile I learned about shade!